Includes: 4th gear pressure switch, internal wiring harness, external wiring harness, vacuum switch. LG4s built for export weren't equipped with a computer-controlled carb. The lockup of the TCC was controlled partially hydraulically by the transmission valvebody, and partially electrically. Inside the valvebody, for the TCC to be locked, both the converter clutch apply valve and the converter clutch shift valve needed to be in the lockup positions. The tension of the converter clutch throttle valve spring was balanced against governor pressure to determine a minimum TCC apply speed. The minimum lockup speed could be raised or lowered by changing or altering the spring. Vehicles with an ECM controlled TCC replace the valve, spring and sleeve with fixed plugs, bypassing this function. If the valvebody of a pre-87 transmission has the holes bored, the valve and spring can be installed. The converter clutch apply valve was controlled by the TCC solenoid. When the solenoid was energized, the apply valve would move to the lockup position. It's not desirable to engage the TCC under load, so a vacuum switch ("Trans Conv. Switch" in the diagram above) was also used to sense engine load. At large throttle openings, vacuum would drop and the switch would open, removing +12v power from pin A of the TCC connector. This would remove power to the TCC solenoid, and the converter clutch apply valve would open and the converter would unlock. Vacuum for the switch was taken from the same ported vacuum source as the EGR valve. A ported vacuum source has no vacuum while the throttle is closed, so the TCC was unlocked to allow closed-throttle coasting. A thermal vacuum switch was also used in the factory setup to keep vacuum from being applied to the switch until the engine coolant reaches operating temperature, the idea to allow the transmission fluid to reach operating temperature faster. GM changed the internal wiring of the 700R4s used in thirdgens a number of times. These diagrams are what I've seen, but there may be other variations. 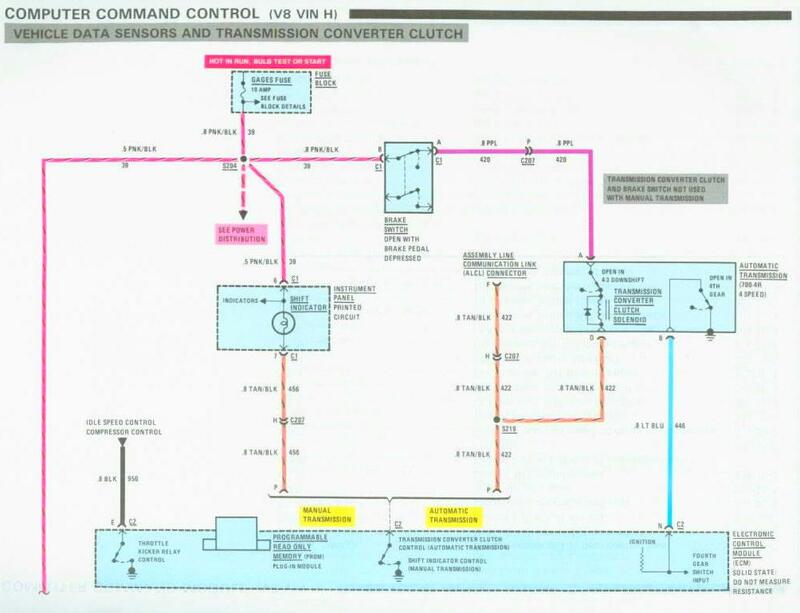 Aside from the export non-CCC setup, some early units used behind V8s looked like the diagram above, with a normally-closed switch to signal the ECM when the transmission was in 4th, and a "4-3 pulse" switch, which interrupted the solenoid circuit to unlock the TCC only while the transmission was in the middle of a downshift from 4th to 3rd. The 4-3 pulse switch was found to cause a flare on the downshift though, and was eliminated sometime around 1984 or 1985, as below. Early V6 cars never received the 4-3 pulse switch, and also looked like the above. At some point after 1987 or so, GM started using a normally open 4th gear switch, and also added a temperature switch to force the TCC to lock up in 4th gear regardless of ECM input if the transmission started to overheat, as below. The external wiring stayed relatively constant in all years, regardless of what went on inside. Power through the brake switch on pin A, the ECM switched ground through pin D to lock the TCC, and the 4th gear switch signalled the ECM through pin B regardless of its orientation. 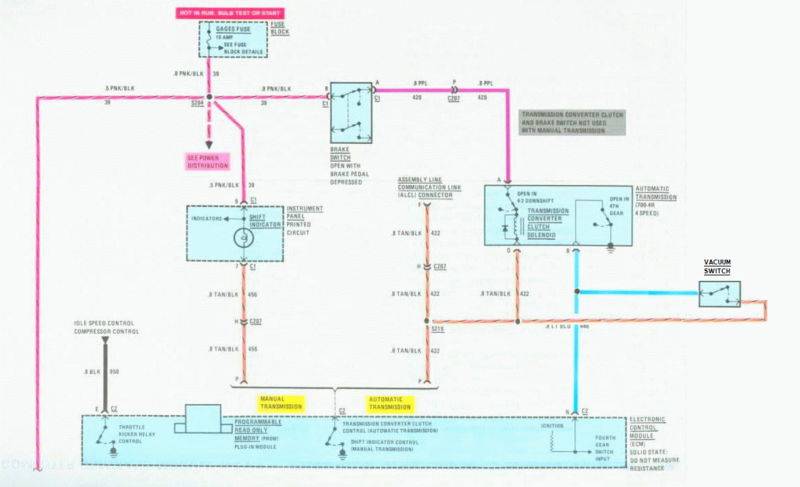 From the wiring diagram, you can also see how you can still lock the TCC through the ALDL, even if the ECM is removed. To wire your TCC for non-ECM operation, you first need to figure out which wiring configuration you have. I'm assuming that your transmission came out of a thirdgen originally. If you're working with one from another application, the wiring could look like almost anything inside, so you'll have to take the pan off to see. Be prepared to do some rewiring on your own. If you have an earlier year model, you'll have some variation of the circuit with a N.C. 4th gear switch. If you have a later model, you may have a N.C. or N.O. switch. You can tell the difference easily without dropping the pan by checking for continuity between pin B of the transmission case connector and ground with the engine off. If you have no continuity, you have a N.O. switch, and you can proceed without dropping the pan. If you do have continuity, you have an N.C. switch, which needs to be replaced for an N.O. one. You'll need to drop the pan for this, but it was probably time to replace your transmission fluid and filter anyway. The position of the switch is shown on the wiring diagram, but it's easy enough to find since it's the switch with the single terminal. It just unscrews with a wrench, and the 8642473 switch threads in its place. Connect the wire from the old switch to the new one. If you find you have a 4-3 pulse switch on your valvebody, you may choose to eliminate it, and connect the two wires that were leading to it together, or you may choose to leave it alone. With an N.O. 4th gear switch, now you have a few options. The minimal way to get things working now is to just put a jumper between the wires going to pins B and D (light blue and tan/black in the diagram here, your colors may vary) on the factory harness. The solenoid will still get +12v through the factory brake switch as before. When when the transmission shifts into O/D, and the solenoid will be grounded through pin D, pin B, and the switch, completing the circuit to lock the TCC. It's easy at any time to unmolest the factory harness by removing the jumper wire. The TCC will work the same as in the first article posted by whiley, except that the brake switch will unlock the TCC during braking. This still leaves the TCC locked up during coasting. You may also find that under part throttle acceleration without enough throttle to cause a downshift, that the car feels sluggish with the TCC locked. 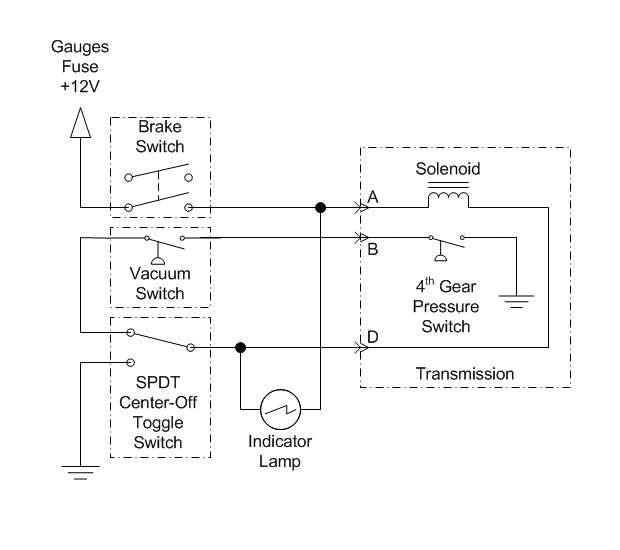 Both of these issues may be corrected by using a vacuum switch connected to a source of ported vacuum to bridge the wires to pins B and D as shown in the diagram below. The vacuum switch will open under low ported vacuum with the throttle closed, or under part-throttle acceleration. This arrangement is identical to the operation of the TCI/Painless/Jet kit above, with the addition of the brake switch which the TCI and Jet kits don't include. If you choose to use an adjustable vacuum switch, you can vary the amount of vacuum that the switch opens to adjust the part-throttle unlock behavior. With a vacuum switch, you may find that under certain conditions, such as driving up hills at constant speed, the TCC will cycle between locked and unlocked. This happens when the throttle is depressed to reduce vacuum enough to unlock the TCC, but then engine RPM increases slightly which increases vacuum enough to allow the TCC to lock, which then decreases engine RPM and vacuum, and so on. The effect is even more likely and more pronounced (and more distressing) when using a high-stall converter. If this happens, you can use a 14020691 vacuum delay check valve in the vacuum line to the switch. The valve allows air to move freely through it in one direction, responding immediately to decreases in vacuum, but closes down to a tiny orifice in the other direction, allowing vacuum to increase only slowly. When used in the vacuum line, the valve will cause the vacuum switch to open and unlock the TCC immediately when the throttle is opened, but will delay the closing of the switch and the relocking of the TCC by several seconds. If you find that the relocking delay isn't long enough, you can add additional valves in series. Since the vacuum delay check valve is a directional device, it does matter which direction you install it in the line. I don't remember which direction is which, but it's easy enough to tell when it's installed correctly. 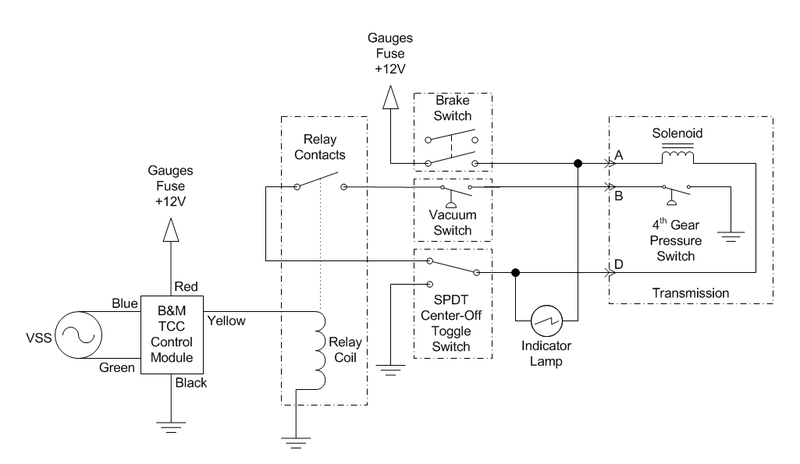 With a little creativity, one can imagine more complicated arrangements, like this one that uses a center-off SPDT toggle switch to allow manual override of the TCC operation. Flipping the switch one way allows the TCC to lock and unlock automatically. Flipping it the other way manually forces the TCC to lock. Putting the switch in the center off position manually forces the TCC to unlock. I threw an light in there to indicate when the TCC is locked, because chicks dig blinking lights. For my own car I went one step further. I have a largeish cam and a 3500 RPM stall on the converter. In city driving the transmission will shift into 4th gear at an RPM well below the powerband of the engine. Normally the TCC would lock then, and you'd have to put your foot fairly far into it to reduce the vacuum for it to unlock. I need to fix the shift timing of the transmission to deal with this, but in the meantime I'm also using a B&M lockup kit to keep the TCC unlocked below 70 km/h. The B&M kit switches the positive side of the solenoid circuit, which normally would defeat the high-temperature lockup switch that my 93 model 4L60 has. Keeping the temperature switch working is a Good Thing, so I use a relay on the output of the B&M control to switch the ground side of the solenoid. If you have information to add to this sticky, please contact one of the Carburetor forum moderators. Running stock small cap CC-HEI as a cheap "locked timing" distributor?